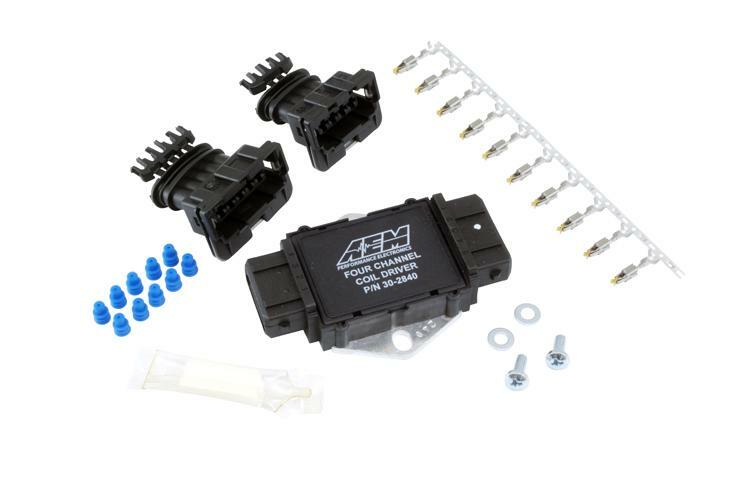 AEM’s ignition coil driver for distributed and individual cylinder spark racing engine applications. The AEM Coil Driver is custom manufactured to AEM’s specifications by HÜCO Electronic GmbH in their ISO 9001 facility in Germany. Specially designed by AEM for driving the high power dwell controlled ignition coils commonly found on performance engines. The Coil Driver is the perfect solution for delivering reliable spark energy on distributed racing applications. They are ideal for ATVs, motorcycles, snowmobiles and racing vehicles with hardware space limitations. The 1/3/4-Channel Coil Drivers drives two-wire (“dumb”) coils in COP applications, and can also be used as replacements for a stock coil driver. Drive ignition coils on a coil-on-plug set-up without a CDI!